Any comments welcomed. The only answer that springs to my mind is ‘disaster’ but I can’t get my head around why. 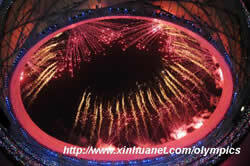 What a fantastic display was the opening ceremony in Beijing of the 2008 Olympic Games. Beautiful, exciting and at times emotional, at least it was for me. The effort, planning, imagination and energy that went into this event was staggering and just shows what wonders human beings can produce. Quite rightly there has been a lot of criticism of China’s record on human rights but hopefully, in time, they will improve on this. It should always be remembered that we in the West are not innocent when it comes to human rights. Here in the UK there are frequent miscarriages of Justice and Parliament has just agreed to imprison people without charge for 42 days. In the US they still execute people, even in defiance of International Law and torture prisoners in Guantanamo Bay and elsewhere. China has come a very long way in just 70 years or so and the standard of living and yes, human rights also, have steadily increased over this time. A huge country with a vast population that was mainly feudal such a short while ago progressed rapidly under communism and I submit, would never have happened under the capitalist system. While we may rightly point out the faults in China let us not forget that we have many faults of our own. When the hurricane struck New Orleans a few years back almost at once an appeal was raised to help the people rebuild their homes and lives. I don’t begrudge this for one moment but New Orleans is a city in the richest nation on Earth. A couple of weeks ago an appeal was immediately launched for the survivors of Burma but China, who has an estimated 50,000 dead and widespread damage as a result of an earthquake, no appeal for the survivors has so far been mentioned. Something wrong don’t you think?